In 1906, he joined a group of Romanian nationalists in the Budapest Parliament (the Romanian National Party of Transylvania and Banat), becoming an important opponent of the Hungarian governmental policy of forced Magyarization of Romanians, and fought for the right of Transylvania to self-determination. Disappointed by the Austrian cause after Franz Ferdinand's assassination in Sarajevo, and turned towards an advocacy of Transylvania's union with Romania; he and his party presented a demand for self-determination along Wilsonian principles to the Hungarian legislative in October 1918. In December 1918, after Hungary surrendered in World War I, he was part of the Transylvanian council that proclaimed the union with Romania, and was, alongside Vasile Goldis, Iuliu Hossu, and Miron Cristea, a member of the Transylvanian group of envoys that presented the decision to King Ferdinand I in Bucharest. Vaida-Voevod joined the Romanian delegation to the Paris Peace Conference of 1919, and was one of its most prominent members throughout the negotiations, as an organizer of press campaigns. 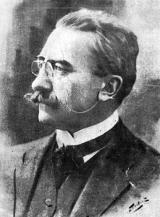 The elections of November 1919 were successful for his party, and he replaced the National Liberal Ion I. C. Bratianu as Prime Minister and Nicolae Misu as Foreign Minister. He secured the new borders by ordering Romanian troops to fight off the Hungarian Soviet Republic. However, his radical approach toward the land reforms made King Ferdinand dissolve his government in March 1920, to be replaced by one formed by General Alexandru Averescu's People's Party (a populist movement that had attracted Bratianu's conditional support). Vaida-Voevod's party emerged as the National Peasants' Party in 1926, and he served as its leader. Vaida-Voevod was arrested on March 24, 1945. In 1946, he was put under house arrest in Sibiu, where he spent the rest of his life.